The draft for Russian pharmaceutical serialization regulation has been taking the rounds for comment lately. By the end of June, 2016, the technical properties of the federal repository and tracking system FGIS MDLP (ФГИС МДЛП) should be laid down. In the beginning of November, 2016, a pilot program should be started with the first drug classes being serialized from January 1, 2017. What is interesting is that Russia is planning a full serialization and track & trace system from the pharmaceutical manufacturers to the end users with extra functionality. The planned FGIS MDLP would provide the manufacturers, supply chain and end users of pharmaceuticals many services not available in, e.g., the incoming European system. In fact, the original European EDQM e-TACT included a vision of consumer applications, but this has been dropped from the services provided by the EMVO and its national sub-repositories. The more interesting services planned to be provided by the system would be e.g. price controls on the vital and essential medicines. Here are some of the functions that would be available in addition to the usual authentication and track & trace services. It will be interesting to see, which of them will make it to the working system. Consumers would be able to compare the price of the drug to its official price limit, find which pharmacies do have the drug available, and get the patient information. Manufacturers would be able to get real time data on the logistics and storage of their products in the market. Pharmacists would return information related to the price controls. Health care institutions would be able to place orders for medicinal products. Federal agencies would have capability to monitor all medicinal products on the market to facilitate price controls as well as report and analyze the trade. 7VZN (7 ВЗН): The seven high-spending disease classes such as treatment of haemophilia or multiple sclerosis and patients after organ transplantation. ZhNVLP (ЖНВЛП): Vital and essential medicines. Subject to upper price limit set by the authorities. All other medicines for human use. The three medicine classes will have deadlines for serialization in January 1, 2017, 2018 and 2019, respectively. The proposed deadlines are very tight, to say the least. There will be meetings up to June 2016 to process the feedback to the concept paper and decide the technical details, scope and timetable for the Federal pharmaceutical serialization project. By the end of June, 2016, the technical properties of the FGIS MDLP should be laid down. In the beginning of November, 2016, a pilot program should be started. The pilot program should have one pharmaceutical manufacturer, one chain of pharmacists, a list of medicines and the federal overseer organization (in this case the Federal Service for Supervision of Healthcare). The comments are still somewhat contradictory to each other. Some comments say using stickers to place codes on the medicine packages would be prohibited. It seems that the codes must be printed directly to the primary package - except when importing a limited quantity of expensive and seldom applied drugs using a sticker would be allowed. One should note that Russia is part of the Eurasian Economic Union (EEU) for which the regionally differing information (local official language or Russian) can be added as a sticker to a reserved area on the consumer package. 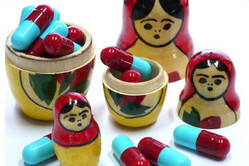 The Russian authorities are proposing that coding including the country of manufacture, the manufacturing company, batch number, expiry date, and an unique identifier would be presented in the medicine package. The country and company codes would be provided by the state authorities. Technically, these codes could be incorporated into existing GS1 standards, e.g., country of manufacture as the GS1 field (422) Country of origin or (424) Country of Processing. The brand owner is identified by the company prefix of the GTIN code. It will be interesting to see if the final specification will require the manufacturer to be identified in addition to the brand owner (the case of a CMO) and whether this is about the manufacturer of the medicine or the active ingredient. The Russian pharmaceutical serialization concept is still evolving but it is clear that the deadlines will be very tight. Up to date it seems that the system will resemble the European system from the serialization point-of-view. For the manufacturers and brand owners, it is essential to keep an eye on the developments to be ready to implement the Russian coding in time. If you need any help, please contact us any time.